StreetLeverage is excited to announce its partnership with the MARIE Center to provide coverage of the 2014 Institute on Legal Interpreting (ILI) held in Denver, CO August 21-23, 2014. The 2014 ILI conference will give participants a unique opportunity to collectively observe, analyze, and discuss the performance of highly effective Deaf-hearing and hearing-hearing interpreter teams in courtroom settings. StreetLeverage will be extending the ILI conference to the Deaf and interpreting community via the live streaming of plenary and panel discussions, interviews with conference organizers and speakers, and micro-blogging during the event via Facebook and Twitter. Streamed sessions, interviews, and event photo will be posted below. Stay tuned! * Live streaming video is available on the date and time of the event listed. A recorded video of the event will be available after the session. Carol-lee Aquiline & Sharon Neumann Solow sit down with Brandon Arthur to share their excitement about the ILI and their hopes for participants. 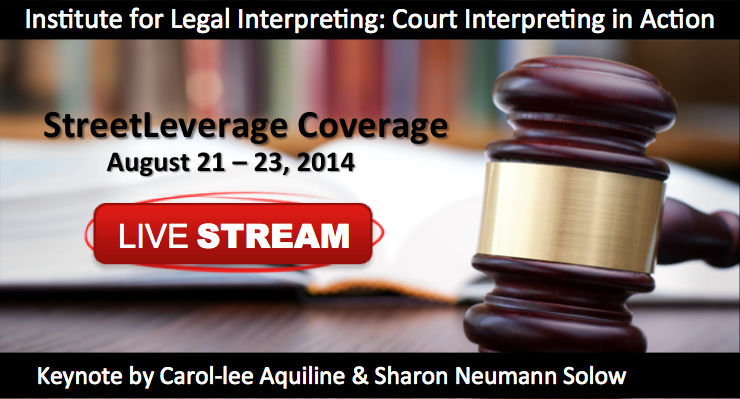 Anna Witter-Merithew sits down with StreetLeverage curator, Brandon Arthur, before the 2014 Institute for Legal Interpreting Conference in Denver, CO. The Deaf-Hearing interpreter teams from the analysis of team interpreting performance videos will engage in a panel discussion with conference participants. As well they will reflect on their performance, identify factors that contributed to their decisions, and discuss their own observations about the implications of their decisions. Participants will also have opportunity use their observations to formulate and pose questions panel members. Carla, Legal Program Director at the MARIE Center, sits down with StreetLeverage curator, Brandon Arthur, to share some insights about the work of bringing the 2014 ILI to life in Denver, CO.
Jimmy Beldon, CDI and nationally-known educator, sits down with Brandon Arthur, curator of StreetLeverage, to share some of his thoughts about his unique role at the conference and how working together is the only way to remove the systematic bias preventing Deaf interpreters from finding more opportunity. Take a walk with StreetLeverage through the crowd on a break at the 2014 ILI conference in Denver, CO. Who do you know? The Deaf-Hearing interpreter teams from the analysis of team interpreting performance videos will engage in a panel discussion and will reflect on their preparation sessions, identify factors that contributed to their decisions, and discuss their own observations about the implications of their decisions. 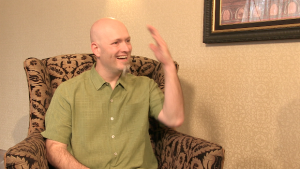 Kelby Brick sits down with StreetLeverage curator, Brandon Arthur, at the 2014 ILI to discuss his perspective on the critical nature of utilizing Deaf-Hearing Interpreter teams, particularly in legal settings. Liz Mendoza took a few minutes to sit down with Brandon Arthur, StreetLeverage curator, to describe the new RID Legal Interpreter Member Section (LIMS) Diane Fowler Award and share her experience attending the ILI conference. This endnote presentation will summarize the salient discoveries of the conference and identify specific opportunities and actions that participants can take to continue the learning associated with the analysis of interpreting performance. The best practices identified during the conference will be highlighted with review of the examples that distinguish the practices as effective. Participants will receive a set of DVDs of the interpreting performance reviewed during the conference, as well as additional footage, which can be used in concert with the workbook to engage in continued independent or group study activities.